Smouldering several thousand light-years away in the constellation of Sagittarius (the Archer), the Trifid Nebula presents a compelling portrait of the early stages of a star's life, from gestation to first light. The heat and "winds" of newly ignited, volatile stars stir the Trifid's gas and dust-filled cauldron; in time, the dark tendrils of matter strewn throughout the area will themselves collapse and form new stars. 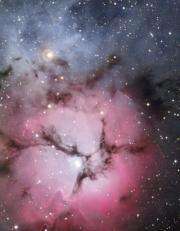 The French astronomer Charles Messier first observed the Trifid Nebula in June 1764, recording the hazy, glowing object as entry number 20 in his renowned catalogue. Observations made about 60 years later by John Herschel of the dust lanes that appear to divide the cosmic cloud into three lobes inspired the English astronomer to coin the name "Trifid". Made with the Wide-Field Imager camera attached to the MPG/ESO 2.2-metre telescope at ESO's La Silla Observatory in northern Chile, this new image prominently displays the different regions of the Trifid Nebula as seen in visible light. In the bluish patch to the upper left, called a reflection nebula, gas scatters the light from nearby, Trifid-born stars. The largest of these stars shines most brightly in the hot, blue portion of the visible spectrum. This, along with the fact that dust grains and molecules scatter blue light more efficiently than red light — a property that explains why we have blue skies and red sunsets — imbues this portion of the Trifid Nebula with an azure hue. Below, in the round, pink-reddish area typical of an emission nebula, the gas at the Trifid's core is heated by hundreds of scorching young stars until it emits the red signature light of hydrogen, the major component of the gas, just as hot neon gas glows red-orange in illuminated signs all over the world. The gases and dust that crisscross the Trifid Nebula make up the third kind of nebula in this cosmic cloud, known as dark nebulae, courtesy of their light-obscuring effects. Within these dark lanes, the remnants of previous star birth episodes continue to coalesce under gravity's inexorable attraction. The rising density, pressure and temperature inside these gaseous blobs will eventually trigger nuclear fusion, and yet more stars will form. In the lower part of this emission nebula, a finger of gas pokes out from the cloud, pointing directly at the central star powering the Trifid. This is an example of an evaporating gaseous globule, or "EGG", also seen in the Eagle Nebula, another star-forming region. At the tip of the finger, which was photographed by the Hubble Space Telescope (http://www.spacetelescope.org/images/html/opo9942a.html), a knot of dense gas has resisted the onslaught of radiation from the massive star. I agree that these cosmic regions of violence are the sites of the birth and death of stars. The observations seem inconsistent with the nebular story of star formation from interstellar clouds. Seems pretty consistent to me Oliver. Not at all what YOU need in any case. You need lots and Lots and LOTS of supernova. One for every single star and for the stars that blew up as well. Sorry for the new signature. But It Needed Killun. Quantum Physicist, torturer of AGW religious zealots like Ethelred because i laugh at his hysterics. Qubitwit gets the rest of August in my signature for aiming his idiocy at me. Again. Ethelred! Ethelred! out of the bag my boy, Oliver posted a reply!!! Or are you doing as i asked elsewhere, getting off the damn computer to go outside and see if you can help an actual person with SOMETHING other than correcting their stupidity???? Oliver that is the same stuff as always. None of it has ever shown a single neutron in combination with other particles fissioning on their own. Xenon atoms have nothing to do with your claim of neutrons powering the Sun. They are evidence that a Supernova was involved in the formation of our solar system. No doubt about that but it simply doesn't have a thing to do with your claim of and Iron or neutron Sun. Ethelred! Ethelred! out of the bag my boy, Oliver posted a reply!!! Its the same reply as always. He just reposts the stuff that doesn't support him. I have already read all that. OK I only sampled some of the links this time to see if anything was different. Even I have to budget my time a bit. A meaningful reply would be actually in some way engage in dialog. However this is as close as he has come in sometime. He gets an attaboy for that. If he admits that he can't give evidence to support his claims I will congratulate on taking a major step. Do you have clue that I don't take advice from trolls? Especially one that has supported spammers. I work retail. I deal with people all day. Every once in a while I even tell people that you should find a friend or even a kid in the neighborhood to help them. Sometimes I feel like banging my head against the wall but the wouldn't help either. It is amazing just how many people tell me that nothing is happening at all on their PC so they must have a virus. Then after pulling two incisors and a molar they admit that nothing did not consist of a black screen. In some cases nothing was them not getting to the damn site that infected them. Some people shouldn't be allowed to own billions of transistors without a helping hand. You remain mine till the end of the month. Then you will be released. Kind of like the idiots that picked fights with me in junior high. They learned faster than you. I am having fun. You are trolling me and losing. More fun. You are on your second week of obsessing about me. So it is pretty clear just who is owned. I believe the phrase 'get a life' applies to you. But don't bother if you don't want too. As for scrawny I ran Track and Field. The Sport of Nerds. And thank you for being so predictable. Typical of trolls on every site. Begging will still not avail you. You stay in my sig till the end of the month. Obsess all you want. Prove my point for me. Oh and the right to way to slit your wrists is along the arm and not across. Running around the block might help but the guy that did finally called the a hospital and survived.